My three children have been exposed to music since the womb and I am pleased that they have expressed an appreciation for all types of music and musical instruments. 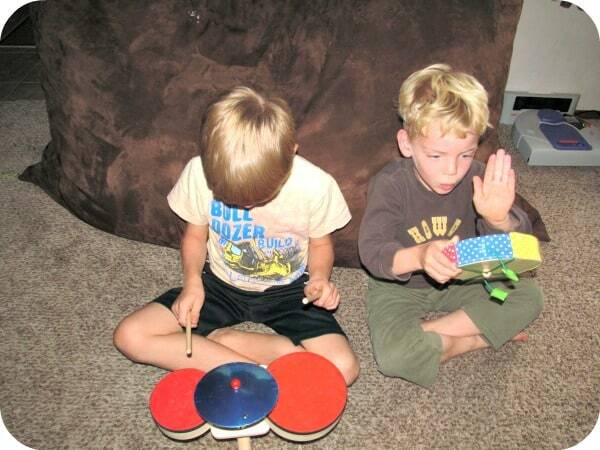 Therefore, they were very excited to try out the Musical Band and Tot Drum from Play Toys. Plan Toys is renowned for having the highest quality eco-friendly toy line that uses sustainable materials and practices. We have enjoyed Plan Toys in our family for years and I am always impressed with the quality and durability along with the fact that the toys promote and inspire my children’s imagination and creativity…..all without the need for batteries! All three of my children, but especially my seven year old son, Adam loves making music with the Musical Band from Plan Toys. 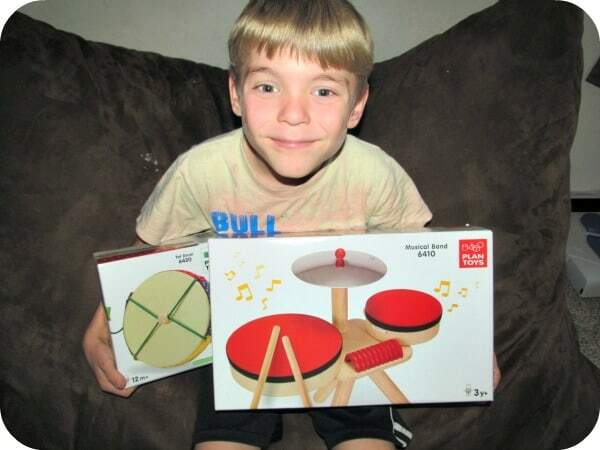 This drum set stands at 13 inches tall and is perfectly sized for younger children. It doesn’t take up a lot of space and surprisingly it has exceptional sound quality for a toy instrument. The Musical Band set includes two drums of different sizes, a pair of drumsticks, a guiro and a cymbal. The vibrant colors and natural wood are very attractive and drew in my children for a jam session. 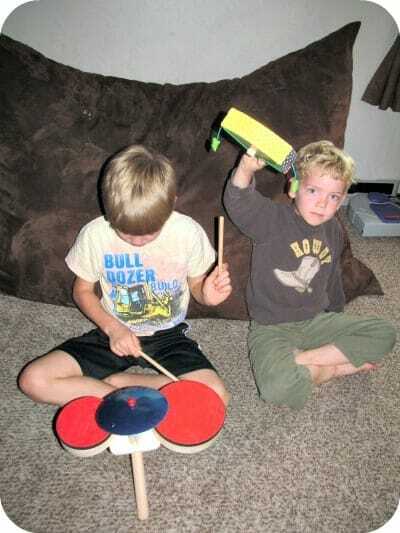 Joining in the band, my five year old son loves the Tot Drum which is a double sided string or percussion instrument. It is sized for little hands and was very easy for him to grip. He loved banging away to the music and his smile was priceless to watch as he did his solo performance for the group. I homeschool my children and this Plan Toys musical set is the highlight of our three times weekly music appreciation class. I use it to demonstrate rhythmic sounds, melody and percussion and it is a great way to encourage their interest in learning more about different styles of music. These musical Plan Toys have provided my children with hours of fun and are so durably made that I expect it to last for a very long time to come. I can feel confident that Plan Toys is safe for my family because it uses water-based non-toxic dyes, organic paint, chemical free Rubberwood and recycled and recyclable materials. You are invited to visit the Plan Toys website to learn more about all of the wonderful toys in the product line and for young music lovers so be sure to check out all of the musical and melody toys. These would make excellent gift ideas for the holidays and is sure to be a hit with the recipient! To find Play Toys at a store near you visit the Plan Toys store locator or shop online. These look like excellent toys! We are not really a musical family, but it would be fun to try out some of the sets anyway. Thanks! Sounds like fun and a great way to encourage their love of music. Plan Toys make great products. We have a couple of their toys and they are really heirloom quality. Loved the review! Excellent gift for my music loving children! This would be perfect. My son really is getting into the idea of learning music! My little girl would love the drum set and I love the fact that they are from a sustainable company.Thanks for the review, I’m going to have to go check out the site.